You’ve spent the last five or so years in school and have finally finished your practicum. 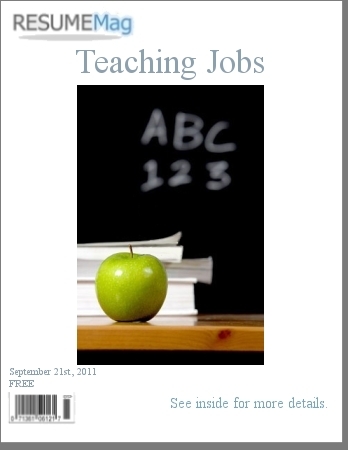 At long last it is time to teach, but without an actual teaching job it can be quite difficult to do. To tell you the truth, I think that trying to teach without a job may actually be called preaching, which is typically reserved for ordained priests and those crazy guys on the street corner. So unless you in fact are a priest, you’ll need to find yourself a job, and fast, before you end up on that street corner I was talking about. 1) The very first thing you will need to do is determine which districts you will be willing to work in. Are you going to stay local, or are you willing to branch out as far as possible to find a teaching position? 2) Now before you even begin contacting schools about openings, you will need to work on your resume. A professional teacher resume will help you to get to the top of the list when it comes time to call prospective teachers in for interviews. 3) Once your resume in up-to-date you’ll want to begin contacting the school districts human resource departments about current teacher job openings and their application procedures, this includes full contract positions and the substitute teacher list as well. 4) After you have found out about the application procedure, you should immediately get yourself on the as many substitute teacher lists as possible. The more experience you gain subbing, the better chance of securing a fulltime teaching contract will be. Especially if you sub for many different schools and districts. Like any industry, it is all about networking, and the more you make yourself familiar with a school’s principal, the better chance you will have at getting a teaching job. 5) Keep in mind, there may be thousands of other teachers on the substitute list, and as someone new, you will likely be further down the list. It’ll take a little bit of effort on your part to make yourself known, and one of the easiest ways is to simply introduce yourself. After getting your name on the substitute list visit each school and personally deliver your resume to the school’s principal. Ta-da! A face has now been put to a name. 6) In order to make yourself more hireable, you should spend your free time, like summer vacation, taking courses that will expand on your teaching skills, such as courses for early childhood education, second language training and special education training. 7) Make sure your professionally written resume clearly defines any skills or hobbies that can be transferable into the education system, such as your ability to play, and subsequently coach, basketball, or your background in music or art. Any additional skills in the extracurricular category will make you more valuable, both as a substitute and a full time teacher. In the end, when it comes to teaching jobs, many last minutes decisions are usually made. So in order to be successful, remain as flexible as possible and try not to get too discouraged. Your dream of becoming a fulltime teacher is possible. Tags: career path, employment, resume, teacher, teaching.